Stephanie Meadow is 11 shots off the lead going into the final round at the Kia Classic in California. Meadow, who was tied for second after an opening-round 67, battled to a two-over par 74 on day three to hold a share of 35th place on three under. Former world number one Inbee Park of South Korea leads by a shot on 14 under from Japan's Nasa Hataoka. England's Jodi Ewart Shadoff is tied for 15th on five under with Mel Reid on two under and Bronte Law on one under. Meadow began the third round just five shots off the pace but a double-bogey on the par-four second hole at the Aviara Golf Club saw her slip down the field. 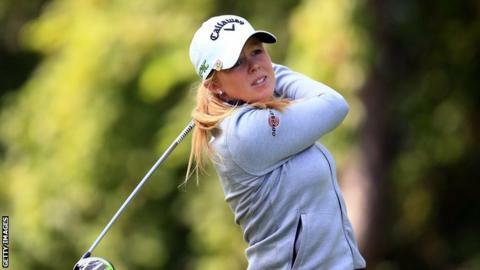 The Northern Ireland woman recovered to card three birdies and three bogeys in perfect conditions. Park, who would move from sixth to fourth on the LPGA career money list with a win this week, holed an 18-foot birdie putt on the 18th for a second consecutive round of 67 and a one-shot advantage over 20-year-old Hataoka, who carded an impressive 64. Thailand's Thidipa Suwannapura, who held a share of the lead after the second round, is in third place on 12 under with Sung Hyun Park and Mi Jung Hur both on 11 under.